EarCatch Ringtone Express – Create catchy ringtones for your iPhone / mobile devices. Versatile ringtone maker to create catchy ringtones for your iPhone, Android, Samsung, Nokia, Motorola. 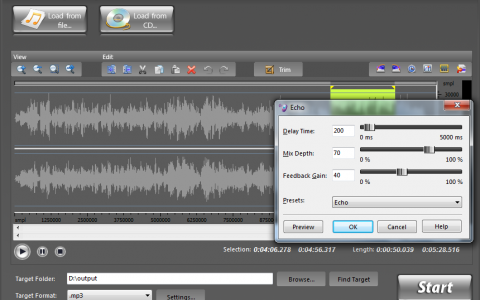 Adjustable Audio Effect with Presets & Real-Time Preview. EarCatch Ringtone Express is a one-stop solution to make ringtones from any sound. It is easy to create highly customized ringtones for all mobile phones. 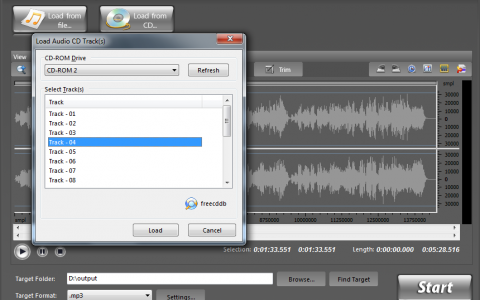 You are enabled to visually clip any segment from your audio files and edit it as needed. 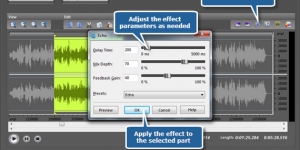 Audio effects like Fade in/Fade out, Echo, Normalize, Amplify, etc. can be applied to make ringtones unique and identifiable. You can increase or decrease the ringtone volume according to your needs. Also, the easy presets and configuration parameters are both provided for amateur and professional demands. It’s 100% safe and easy to use EarCatch Ringtone Express. It is guaranteed not to contain any spyware, viruses or any other kind of malware. The snappy interface enables you to find & use anything you want in just a few seconds. Even elementary users can perform all actions just by one mouse click. Just within 3 steps, you can get your unique iPhone ringtones! 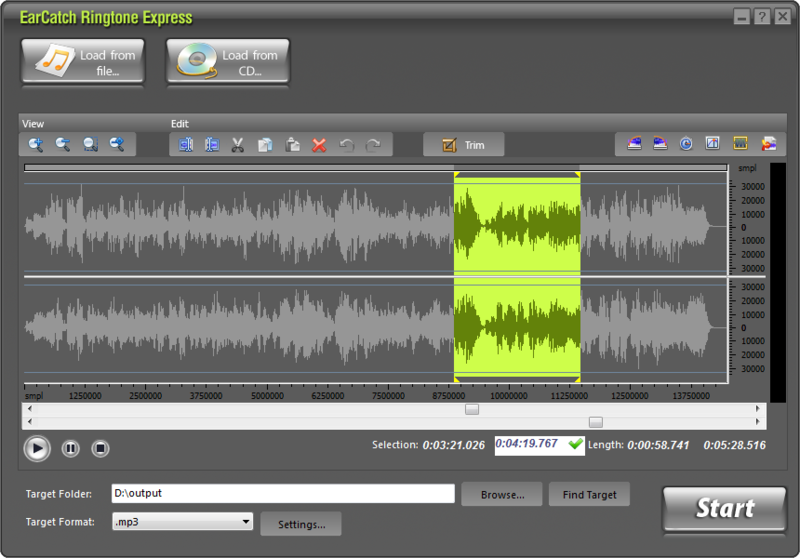 One of the outstanding characteristics of EarCatch Ringtone Express is its ability to cut a part of audio file to remove silence or unwanted sections, so you can easily have your favorite segment of a song or the important part of an interview saved as separate file. If you want to save just a very short portion as ringtone on your mobile, you can select this region and click “Trim” button to eliminate the remainder. 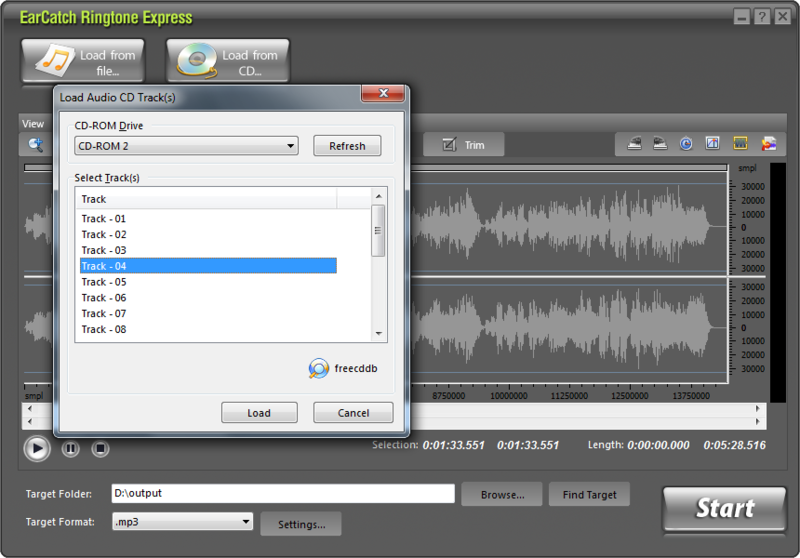 EarCatch Ringtone Express lets you visually edit audio files faster and easier than ever before. 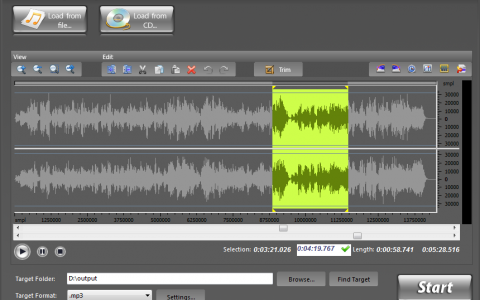 On the visual waveform, you can perform the operations like cut, copy, paste, trim, delete and more to meet your needs. The zoom in & out are provided for better view. To view the signal more clearly, it allows you to zoom the selected region to make it displayed at the whole waveform window. No need to worry about mistakes made during editing because all operations can be restored with unlimited Undo & Redo functions. Millisecond-level precision is supported, by which the ringtone maker can fulfill many more professional needs. 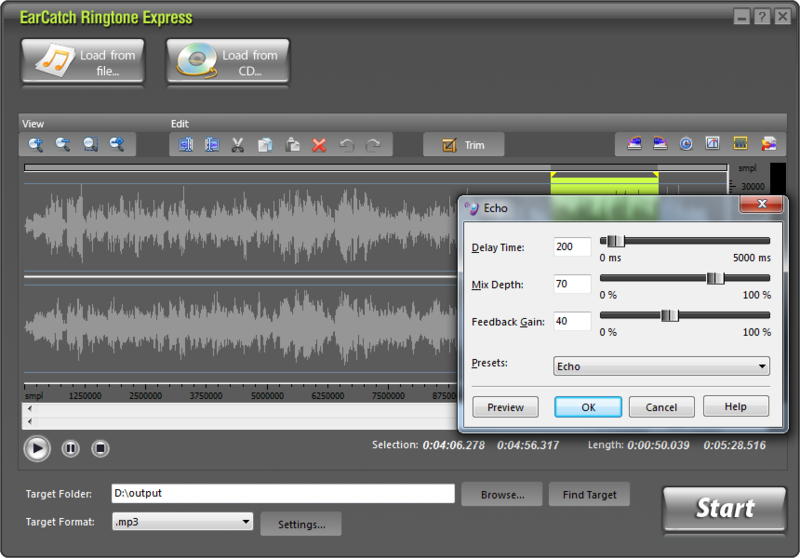 There are several ways to select a region: click on the waveform as a starting point and choose everything before (Shift+Home) & after the current position (Shift+End) to choose the region of the file; click the left button and drag along with the waveform to the place wanted to be selected; specify the session by moving the sliders below the waveform window; input the start, end and length of time to choose specified region at the bottom of the ringtone maker. 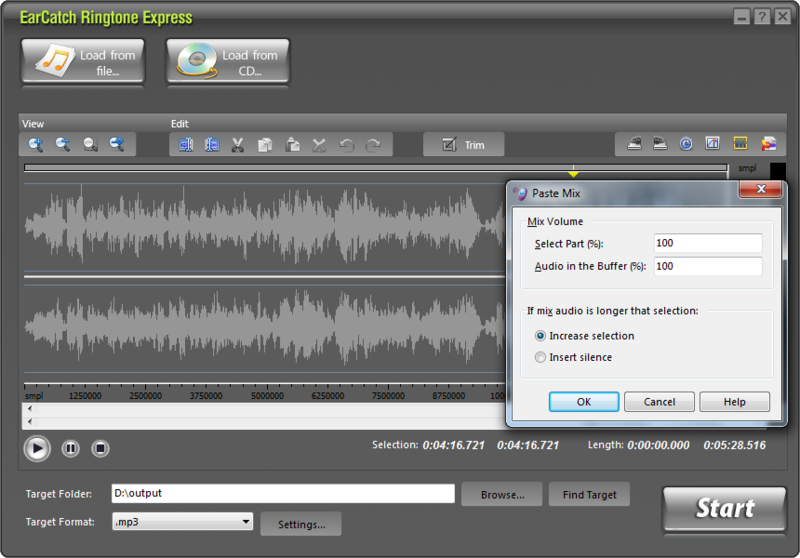 EarCatch Ringtone Express enables you to optimize your ringtones by adding audio effects to the audio selection. 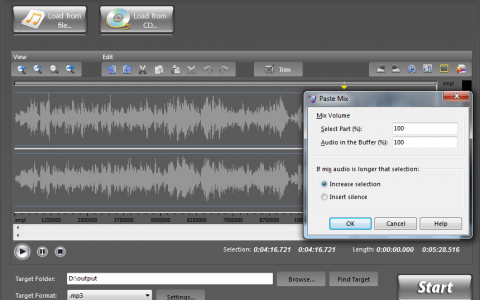 You can use fade in & fade out to gradually increase from silence at the beginning & gradually reduced to silence at its end or create an echo effect of your audio track by replaying the sounds of the selected audio portion after a certain period of time to make it more rich and colorful. You can also increase/decrease the volume and mix the loaded audio with another audio file to make the ringtones more euphonious and unique. If you want to create your own stylish ringtones with different sound effects, many detailed parameters and some popular presets of each audio effect are provided. These presets let you understand how each parameter modifies the sound. They have been designed with ease of use in mind in order to let you focus on the music. You can adjust the parameters manually and choose the preset if you are familiar with the audio parameters and knows exactly what you want. 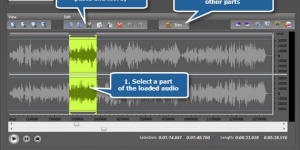 The playback function is provided to play the added or the edited audio at any moment to check the editing you have done. Also, the real-time decoding/encoding allows you to preview the result of each effect – check the effect you have added to see whether you are satisfied or not before mixing down to a single file. Thus you can enjoy the whole course of edit and get your marvelous ringtones. As looking for an unlimited, unrestricted ringtone maker to create a 5-60 sec customized ringtone from MP3, WMA, WAV, Audio CD and OGG files, we think that EarCatch Ringtone Express is your preference. It aims at providing an all inclusive module in one affordable package. Cell phone owners who want to show off their musical tastes no longer have to pay costly subscription fees or waste time and money on ringtone downloads. How to Create iPhone Ringtone?